I just got my new NitroG20 Airgraver and I would like to let everyone know what I have learned so far about it. The NitroG20 has a lot of power but it's not a runaway. You can do light engraving with it but then turn around and really hogg steel out for inlays. On the steel engraving I did all the engraving with the nitro using a M42 graver. On the copper plate I also used a M42 graver. The bright cuts were very easy to cut. I cut a few bright cuts that were pretty big and wide and the airgraver just went right through the copper. My compressor only delivers .90 cfm at 100 psi and it kept up very well it came on about every 10 to 15 min. and the nitro was idling the whole time. For you CO2 guys you can run the nitro without the idle and it does really well. The copper plate is 2x2" and the steel is heat treated 4130 and the engraving is 1/2" x 4"
If anybody has any questions I will sure try to answer them. Hey Mike, The sample plates look great. Thanks for posting them! The airgraver website was recently updated (link) with this large bore tool. NitroG20 was decided on for the name from the suggestions in the earlier thread, thanks everyone for that. The G20 portion of the name comes from the weight of the piston, which is 20 grams. I changed the front end on the tool from earlier prototypes so it can now be made to hold larger graver shanks. The standard tool holder will hold 3/32" square and 1/8" round graver shanks as well as other shanks that will fit within a .133" hole. If someone would like the tool to hold 1/8" square and 3/16" round shanks just let me know and that can be done. Here are piston weights to help compare the Classic stainless and tungsten pistons to the NitroG20 tungsten piston. I want one too with all the motorcycle parts I have to do. That tungsten piston in my palm control is doing the job but I guess I could bast through the aluminum with one of the nitros. I went back and forth between my Classic with the tungsten piston and the NitroG20, the Classic did really well but the Nitro did everything a lot easier. One example of the finesse and the power is, I did some fine lines and then put 45 flat in and stood the graver up and just went after it and it dug in then I laid the graver down a bit and I popped the biggest chip out that I've ever got. Not that you would ever need to do that but the muscle is there. I worked with a 901 for 7 years and did a lot of heavy inlays on bits and spurs I'm talking inlaying 20 gauge fine silver into 4130 steel and it did fine but I think the NitroG20 will do it with a lot less effort. I will be doing some inlays like that pretty soon and I will let everyone know how it goes. Any idea if Nitro would be useful for wood carving too? Has anyone tried? I did try GRS Magnum for wood, but it really wasn't delivering. Is Nitro bigger and meaner than Magnum? Full throttle at 90 psi with the 20g tungsten piston is pretty wild. Do you need the concrete removed from your diveway. Yes, it works well in wood. Have you tried your Classic in wood? It would be similar but you can take bigger bites. At lower throttle use it for shading. Here is an older video of the PalmControl Classic cutting wood. If someone would like the tool to hold 1/8" square and 3/16" round shanks just let me know and that can be done. Some time back, after purchasing a number of your sharpening templates, I sent you an email asking if you offered a holder for using 1/8" square blanks. Your reply was basically "Why." That question has now been answered. If people are going to use the 1/8" blanks in this handpiece and also use your sharpening templates, they need a way to hold them. So I repeat my question, "Are you going to offer a way to hold them in the sharpening templates?" Hi DKanger, Yes the plan is to have a replacement collet or another metal sharpener fixture available at a later date for 1/8". As soon as I can get time to get to it. I'm hand engraving the first few of the palmcontrol vises. That, along with making the new Nitro is taking my time at present. I hope it's sooner rather than later. I've had my templates for several months now and have yet to use them. I made all my H&C graver handles with removable tips using 1/8" square blanks and I did not relish the thought of having to make all new handles. Being able to switch the collets out would be a definite boon. I'm guessing the basic 1/8" fixture is 'just' the current fixture with a larger slot, right? Which would mean that someone with the proper tools and skills could convert their existing fxiture for the larger gravers by expanding the existing slot. But then (I think) it wouldn't work for the 3/32" blanks anymore because they'd now be offset from their proper position by 1/32", right? If I'm right DKanger could file the slot in his holder out the extra 1/32" to make it work (but don't do it until Steve confirms my guesses). Too late. That was the first thing I tried, and discretion being the greater part of valor, I found it too hard and stopped. I also have the smaller blanks too, which I will need more as I make the transition to power assist and I also bought a dual-angle.....but different sized collets sure would be nice. Maybe Steve will call them "Dave's collets" Seem like everything else is named after somebody, so why not a nobody. Hi Dave, I can make an 1/8" collet over the weekend and overnight Monday. 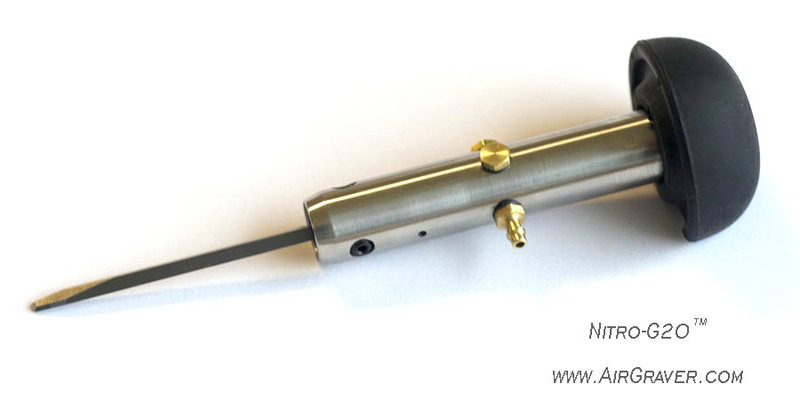 Do you have a micrometer? If so, measure your 1/8" square gravers and see if there are any oversized. I'll make the slot right at .125" but if some of your gravers are a thousandth or two over 1/8" let me know and I'll make the slot wider to fit them. That is truly magnanimous of you but it isn't necessary. I can wait until you put them in production. The gun I am building for a customer won't be ready for engraving for probably 4 weeks or so and I have some tips that I ground when I took Brian's course back in March. I'll just buy another holder with the new collet in it as it seems easier to swap out the holder out of the template than the collet out of the holder. BTW....all the blank tips I have on hand seem to run slightly undersized at .123-124. Hi Dave, I already made it. It was no problem. I left it set up in the mill in case you had oversized 1/8" shanks. I measured some 1/8" square tools bits I had and found one at .126". So I opened the slot up to that size already. I'll call it good there and pull it out of the mill. I can install it in one of the sharpening fixtures and calibrate for you, so the square slot is lined up with the plastic templates and ship that way (you could return the one you have then), or should I just ship the collet and you can square it up yourself in the sharpening holder you have? PS... I just read your post again. Okay, I'll install it in a second holder and ship that way. I think about choosing classic or G20.For all works G20 is suitable? Or for some artworks need classic anyway? And what about vibration between G20 and classic? Can someone with experience tell me how the Nitro does with finer lines? I'm just curious if it does delicate work as well as heavier relief. With it be illogical to purchase a G20 rather than a Classic for doing fairly standard engraving in steel? The classic will do 99.9% of what you will want to do. With the heavy piston you can do almost anything. 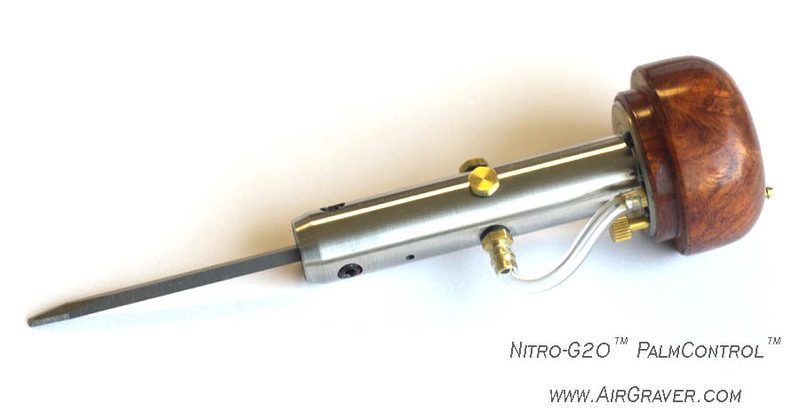 The Nitro is mostly for large engraving (motorcycles and large parts). I have the classic with the standard and heavy piston and it really is all you would need. I cannot see using the heavy piston for fine work so the nitro with the heavier piston to me would not work as well for fine detail. On specal order you can even get a lighter piston than standard for the classic for very fine work. Nitro is really not intended for fine line light engraving. If you are doing standard engraving but ever once in a while your needing something a with a bigger hit I would go with with the Classic and the tungsten piston. You can cut finer lines with the Nitro but I don't think that was Steve's purpose for the tool. The Nitro is also great for western bright cut. but what about vibration in foot control? classic is softer than G20 or not? Vibration? Think about it, 7gram piston versus a 20gram piston. Steve's airgravers don't vibrate. A piston strikes an anvil many times a minute. Are the strikes stronger in the Nitro? yes. Yes Mike, I mean strikes. I would like to have an airgraver and I donot know correct glossory of airgraving , yet. your answers are very good for me. thanks alot. sorry for my bad english!.